In Pseudo binding in HTML service I showed a way of looking for changes on the server from client side htmlservice apps. I've taken that a bit further and created a very straightforward structure to build in client side to react to changes in data (or indeed any property) as well as changes in selection, active sheet and so on. Use it. It will call you every time there are any changes of data or selections in that active sheet. Your callback passed to the .watch() method would typically react to server side changes - perhaps visualizing the updated data or using the active range is some way. You receive 3 arguments each time a change happens in the sheet. 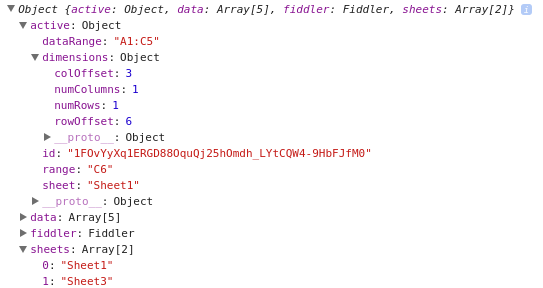 fiddler A fiddler object with the data structured (if requested). Will only exist for the Values property. This is not normally required, but the pack object contains info on what has actually changed. For example, if you are monitoring both data changes and active changes you can test pack.changed.active and packed.changed.data to see which (maybe both) has changed to provoke your function being called. If you are monitoring sheets, then packed.change.sheet will indicate there has been a change in the number of sheets or their names. These are the default values - this will monitor for data and selection changes in the activesheet. You can override these changes by passing an options object when you add the watcher. For example, here is one that watches for changes in background colors, but does not monitor for changes in active selection. You can create and have multiple watchers going at the same time. For example you might have one that watches for just data changes, another for selection changes, one for background color changes and another for changes in font color. watcher.poke(); // this is optional, but it will provoke a refresh of all the polling info. 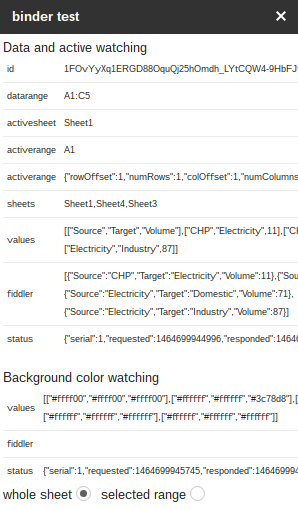 If your data is not suitable for fiddling, or not required, you can turn that off when you set up your watcher with domain.fiddler = false; I highly recommend you spend some time reading up on A functional approach to fiddling with sheet data and using that to manipulate data returned from the sheet.